W series gearboxes have a separate bellhousing. Different bellhousings are used to connect a W50 gearbox to an R or M series engine. Different bellhousings are used to connect a W55 gearbox to an R or T series engine. Alloy W5# gearboxes are interchangeable with each other. Alloy and steel W5# gearboxes are not interchangeable with each other. W50 bellhousings do not fit the W55 gearbox and vice versa. W55 bellhousings do fit the W56, W57 and W58 gearboxes and vice versa. 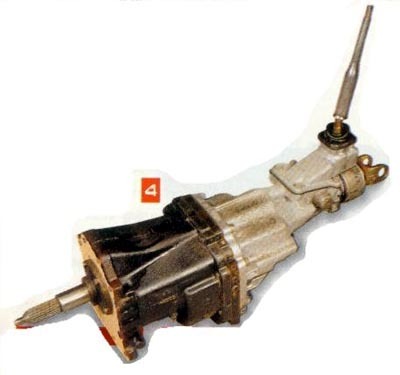 All W## gearboxes after 1970 had the same output spline as the A## automatic gearboxes. 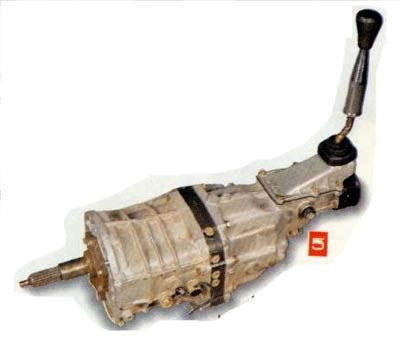 "Performance Build Ups, Volume 9, Issue 1"
This is a heavy-duty 4spd that was used in 4 and 6 cylinder motors in 18R Coronas, Mark 2 Coronas, 6 cylinder Cressidas and Crowns. They're available with two different stick positions. The one in Pic 3 has the kickback shift level and the other version has the lever 2.5 inches further forward. They're very strong and won't break behind a 6. A lot of people use them behind V8's quite successfully and, even if you do break one in such an application, they can be found at wreckers for as low as $50, which makes it economical to simply remove the damaged one and fit a replacement. 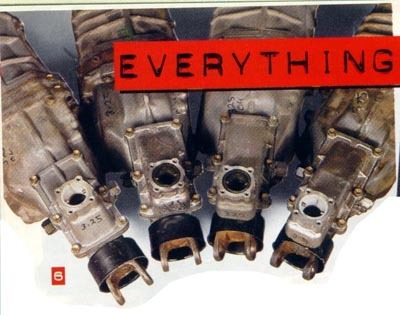 Some people scoff at these boxes because they were used behind 4 cylinder engines, but a closer examination reveals they're ridiculously over-engineered for such an application. If your clutch ever fails, one of these boxes will get you home quite happily as long as you don't need reverse. This is the same as the 4 spd version but you'll note that the rear housing, which contains fifth and reverse, is bulkier. 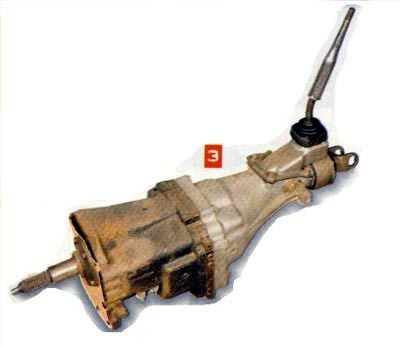 All the details about the position of the shifter, the tailshaft yoke and the bolt-up pattern are the same as for the 4 spd. In the trade, they're commonly known as a steel-case Toyota. They came on 18R, or 2 litre engines in hatchback or mustang lookalike Celicas. They were also used in 6 cylinder Coronas and imported Crowns and in these applications they were fitted with a heavier-duty needle roller bearing in the front cluster. Unfortunately, you can't tell if this is the case until you pull it apart, but if you do and you find the roller bearing, you know the box has been in a 6 cylinder, a turbo model, or a diesel. Hopefully, you'll find a ball bearing which indicates that is was fitted to a NA 4 cylinder and has had much less power put through it. Finding the lower rated box and refitting it with the stronger roller bearing is ideal. They come in 3 first gear ratios. Versions fitted to the 18RG engines, which were Yamaha headed engines, were fitted with a 3.0:1 ratio, which is very high. These versions are fairly rare but can still be found if you look hard enough. There are also 3.25:1 and 3.5:1 versions available. As with the 4 spd, people fit them to V8's, but its not a great idea because, unlike the 4 spd, they're quite expensive ($400). A better choice is the Supra, which is stronger and doesn't cost much more. These boxes first appeared in Australiain 1984 in the 4 cylinder Corona. They were also fitted to Celicas and, obviously, Supras. Both 4s and 6s had exactly the same version, so everything said about using 4 cylinder Toyota 5 spd units applies to the Supra box. There was at least 4 ratios in them, starting with an extremely low 4.0:1, which was fitted to commercial vehicles, following by 3.7, 3.5 and 3.28. 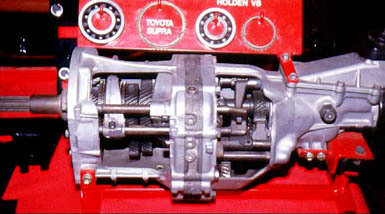 They have the same length input shafts as the other Toyotas and are virtually interchangeable with the steel-case. However, they do have a different bolt pattern. As is commonly known, these boxes are extremely strong. They're much stronger than a steel-caseToyota. Straight from a wreckers, this box will cost about $500, but a stripped and checked version is about $700. There is another, extremely rare and much stronger, version of this box that was fitted to a 3.0 litre Twin Turbo. Its about half as big again as a normal Supra but apart from that it looks the same. It has been known to handle in excess of 550HP with no difficulties. If you can find one, you'll have to pay something like $1500-$2000, but they are very rare. The above transmissions feature a range of gearshift positions as standard. Measured from the front face of the transmission these are : 18, 20, 21, 21.5 inches. image: the multiple shifter housing positions of the W58 gearbox. the ma61 stock position is seen second from the left. eds.au.com is designed to be viewed specifically by current browsers such as Netscape 6.2 or higher. If you cannot view this site properly, for god's sake upgrade you're browser already. check Netscape's site for download availability.